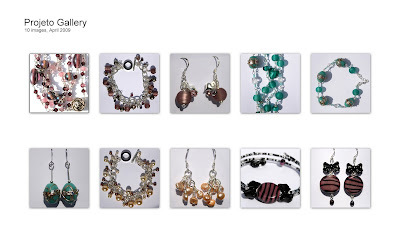 A few weeks ago Paula from Projeto Gallery in Silsden, West Yorkshire contacted me to ask if would I be interested in supplying her with some jewellery items. I was more than a little pleased and after exchanging a few emails with Paula I completed the items and sent them off last week. Check out the Flickr page for some excellent images of the gallery, complete with gallery dog and you might spot a few other Folksy sellers' work there! The image above shows the ten items I've sent and today I've been cracking on with some new bits for my shop and I'll let you know when they are listed!